A criminal case is where a person has committed a crime and the intention of the court is to punish him. It is where criminals are brought to justice for the damages he has inflicted on the other person wilfully or negligently. A civil case is very different from a criminal case because here, the primary objective of the court is to settle the dispute between two parties within court. Common examples of civil cases may be a breach of contract, property disputes, unfair employment termination, etc. As you will note, there is no clear criminal case here, but they relate to a dispute or violation of rules over here that has led to a disagreement between the parties that must be resolved. There are very common cases that can be fought in the lower, high court or even in the Supreme Court, depending on the nature of the case. Specialized advocates are required for such matters too because both sides of the arguments must be laid before the judge so he can make a decision. Compensation and fines are common results of such cases, and they depend on the severity of the violation of the terms. In cases, where a person has suffered mental or physical damages due to the civil issue, compensation is paid to him/her by a person who has broken the law. 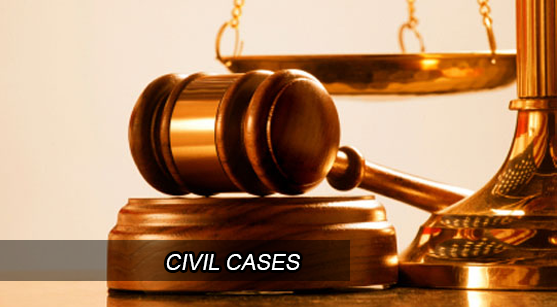 Advocates in Chandigarh has a special team of advocates who specialize in these kinds of cases. They tend to take a little longer to be resolved in the court and can drag on for ages if the case is not fought properly. Our team ensures we represent the party throughout and give advice about how they can make their case stronger by asking for the relevant documents to be given and steps to be followed while the case is on-going.